This story originally ran on March 13, 2014. 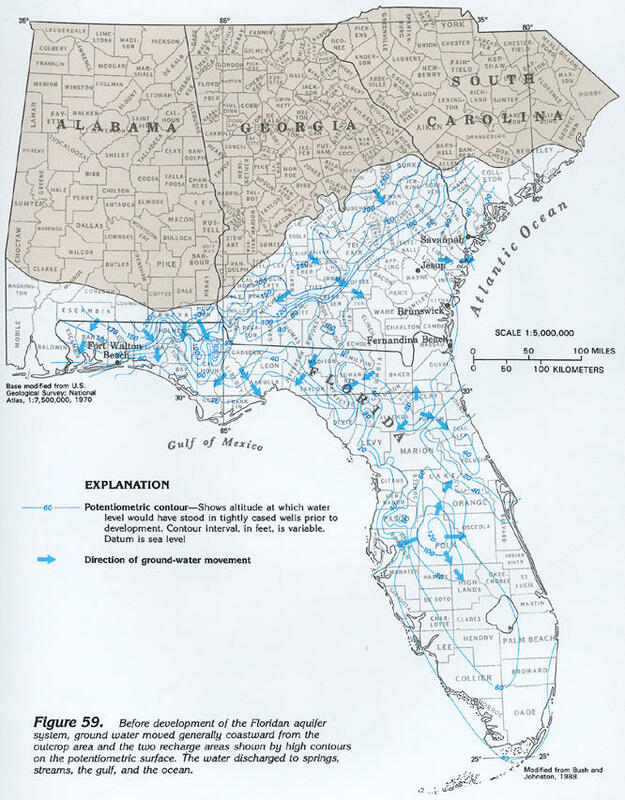 Florida desalinates the most water in the United States. Above is the water treatment plant in North Miami Beach, the first city in Miami-Dade to process salty water from the Floridan Aquifer. If you mention “desalination,” most people probably think you mean taking salt out of seawater, and they probably think you’re talking about what happens in desert nations in the Middle East. In the last 15 years, cities and utilities within the South Florida Water have more than quadrupled the amount of water they can desalinate. Communities around the state are by and large taking salt out of brackish water from the ground. Brackish water is a lot less salty than ocean water, which makes it cheaper to process. 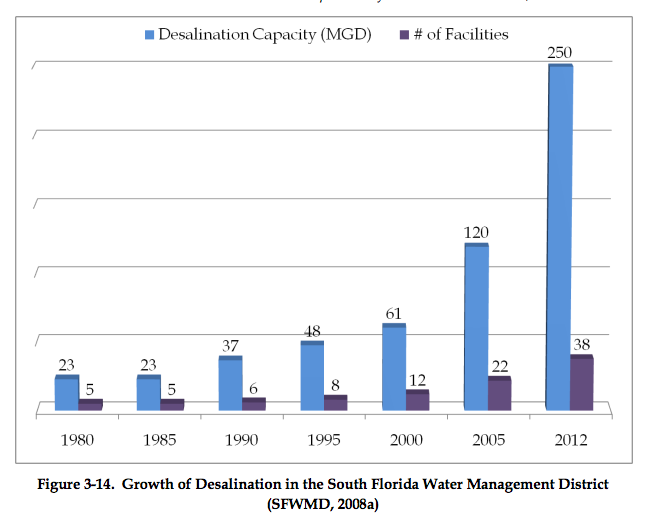 Within the state, the region that’s desalinating the most is South Florida. The reason South Florida’s turning to a saltier water source is that relying entirely on our traditional water source, the Biscayne Aquifer, is no longer an option. That's because we’re not the only ones who rely on the Biscayne: the Everglades do as well. And that already damaged ecosystem would continue to deteriorate if we kept increasing our water withdrawals. We also risked ruining the Biscayne Aquifer itself. Very salty seawater started to get mixed in with freshwater. Salt water is denser than freshwater, but you need a certain level of freshwater to ensure that it will stay on top. Reducing freshwater levels by 1 foot allows salt water to move upward as much as 40 feet. So in the last several years, communities in South Florida and nearby have built facilities to tap into another aquifer, the Floridan Aquifer. Within the South Florida Water Management District, which stretches from Orlando to the Keys, cities and utilities have more than quadrupled the amount of water they can desalinate, from about 60 million gallons a day in 2000 to about 250 million gallons a day in 2012. Most of the state already relies on the Floridan, a huge groundwater source that lies underneath the entire state and parts of Georgia, Alabama and South Carolina. In Central Florida, the water in the Floridan Aquifer is fresh and close to the surface, much as the Biscayne is for us. But as water in the Floridan Aquifer moves south, it picks up salt from the rocks it flows through. In South Florida, the Floridan Aquifer is farther down, more than 1,000 feet, and it’s saltier. How's the salty water taste? If you drank it straight after filtration, it's actually tasteless, with less flavor than freshwater from the Biscayne. The desalination process is so intense, it takes out minerals we're accustomed to. Above was my taste test at Deerfield Beach. To get that salt out, utilities have to use more energy to filter the water, which means more money. Though it depends on the size of the facility and how salty the water is, the cost to process Floridan water is 30 percent to 300 percent more expensive than the Biscayne. But most likely consumers of desalinated water probably didn’t notice a big difference in their water bill. That’s partly because water pricing isn’t a real-time reflection of actual costs and partly because the proportion of water coming from the Floridan is still small in most parts of South Florida. For water customers of Miami-Dade County, a facility for desalinated water just opened up in Hialeah earlier this year. * Once it's fully operational, that plant will provide 7.5 million gallons a day (mgd) of Floridan Aquifer water. But the county supply is about 310 mgd. In the South Florida Water Management District, as a whole, desalinated water provides less than 10 percent of the water used. Despite the cost, the Floridan Aquifer is still a pretty good alternative to the Biscayne because it’s drought-proof. The Floridan is so deep and sits below a layer of non-porous rock, it doesn’t depend on rainfall here. Answer for future water needs? Before development, nearly 90 percent of water from the Floridan Aquifer fed into springs and streams. But it does depend on rainfall in Orlando. Remember that layer of rock protecting the aquifer? It also means none of our rainwater gets in. To recharge, water must travel down from Central Florida, and it takes a long time. “I wouldn’t say it’s quite geologic time,” says Mark Elsner who heads the water supply development section at the South Florida Water Management District. Moreover, we still don’t know how much we can really rely on the Floridan. The South Florida Water Management District is studying how much water South Florida can safely take from the Floridan Aquifer. Central Florida right now is finding that it can’t pump a much greater share from the Floridan without impacting wetlands, springs and rivers up there. Failing that, if our consumption continues to grow, we may need to look to our largest water source, the ocean. And then our water systems would indeed start to look more like desert nations in the Middle East. Stranded on a remote island? You can desalinate your own water. Watch this episode of a PBS series Voyage of the Miami on how do that. Correction: the original version of this web story said that the Hialeah water treatment plant was already providing 7.5 mgd of desalinated water. But though on-line, the plant is still going through testing and not yet routinely providing desalinated water. Florida -- and Miami in particular -- should prepare for habitat destruction, loss of cropland, increased salt-water intrusion, worsening coastal flooding, and a host of related disasters if climate change and sea level rise patterns continue, according to findings in a federal "draft climate report." Are Florida Politicians Responding To Rising Sea Levels? Throughout the legislative session, we've been bringing questions you asked during the WLRN-Miami Herald Town Hall to legislators in Tallahassee. Today's question concerns an environmental issue that's threatening coastal communities.